Welcome to the site! It's a rewarding and seductive hobby. Welcome to the encampment. Feel free to post any questions you guys might have. 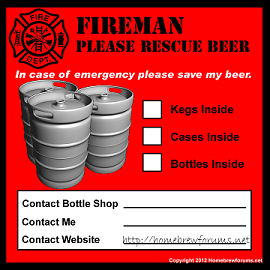 If you let us know when you are planning a brew day we can try to keep an eye out for urgent items. Deserts? In Idaho? I don't believe you. I think she meant Desserts. like really tall apple pies or something. Yes, deserts. Or so they tell me. Guess that would explain the god awful summer heat, but not the lack of cacti. Mostly just sagebrush annnnnd......not much else. We're not farmers or ranchers, so we need something else to entertain ourselves, and while away the hours. Enter beer. Welcome. This is a great online community to get involved with. welcome to the site! and the hobby as well. i'd pour you a pint, but i seem to be disemboweled at the moment. thanks very much kenny! it's too large for you to recognize. if you saw it at 1/4 scale like you're use to, you'd realize what it is immediately. wait... who the heck are you again? I'm pretty new around here but I can say this is the best brew forum around . . . fo sho. Any recipe I've posted has been received with warm support and helpful advice. The wife just made her first home brew, a brown ale - this past weekend. It is a great, rewarding hobby that lets your creative side flourish and so wonderful to do with the significant other. Sniff, sniff - gettin' a little 'motional here. Welcome! Welcome to the site! If you have anything what needs fixin, I work for beer! !